Better Than Happy | Listen Free on Castbox. On last week’s episode Brooke Castillo and I discussed religion and the response has been so overwhelming about how much you loved it. This week I share some additional thoughts based on 5 years of coaching members of The Church about how we sometimes, unconsciously use the very beliefs that can make our lives better, to hurt us. Tune in and gain some awareness to help prevent falling into these traps. To register for a free upcoming webinar with Jody CLICK HERE. Today I am sharing with you a conversation I recently had with Brooke Castillo about religion. We discuss the difference between your relationship with God and your relationship with your religion, where God fits in the model and why our experience of God is so much stronger when we’re suffering. Thanks to Brooke for her willingness to come on the show. I know you’ll enjoy this episode. The post Ep 190. 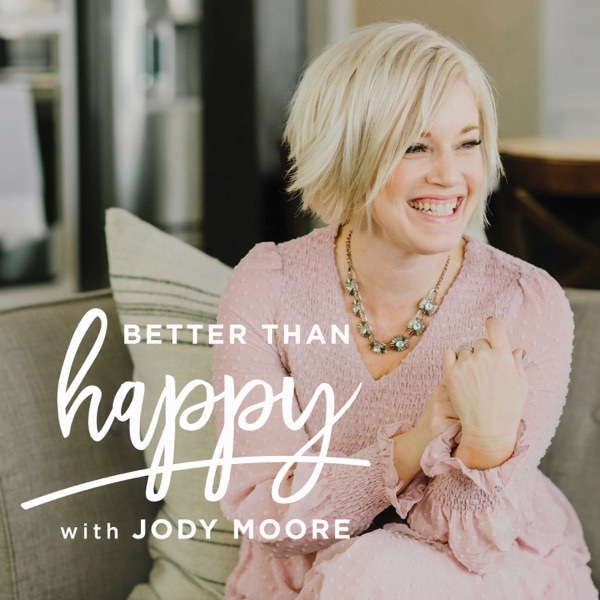 Jody Talks Religion with Brooke Castillo appeared first on Jody Moore. Part of our ability to interact with one another in an appropriate way means we censor ourselves. This is healthy and I wouldn’t want you to drop it. But sometimes we have an opportunity to be more honest with one another about what we think or feel. I wonder what would happen if we all started saying what we mean a little more and believing other people a little more as well. Tune in as I share some ideas about how this can deepen your connections with one another. The post Ep 189. What We Say and What We Mean appeared first on Jody Moore. If you’ve listened to this podcast for long you know that I teach that your circumstance doesn’t need to change for you to get the result you want in your life. I also teach that focusing on the circumstance is not the most effective way, but today, I want to talk to you about the irony of how circumstances sometimes do change once we do the work of not needing them to. Tune in to learn more and for tons of real life examples. If you want to come to a live call and get some free help from me, click HERE. Grab your ticket to Better Than Happy Live in Salt Lake City or Seattle click HERE. The post Ep 188. How to Change a Circumstance appeared first on Jody Moore. One of the questions I get a lot is, “What is the difference between traditional therapy or counseling and coaching?” Today Natalie and I are tackling that question. We’ll tell you what we love about therapy and why we think coaching is a better fit in many situations. Tune in as we discuss the challenges of marriage, how a coach helps you through it, and why we believe not all marriages should last forever. Sign up for a free consultation with Natalie The post Ep 187. Couples Counseling vs. Couples Coaching with Natalie Clay appeared first on Jody Moore.